This is one of essays I wrote for the Doug Tarry Young Ornithologists’ Workshop. The original essay topic was to write about your favorite bird, but I couldn’t choose just one bird, so I chose a bird family instead. I couldn’t include photographs with my application, but I’ve added some below, from the past few years, to this post. I don’t think I have just one favourite bird, but my favourite bird species at the moment is hummingbirds, Trochilidae, because of their beautiful plumage colours, their physical stamina and size, and the fact that I’ve had the opportunity to appreciate them close up, since they seem to tolerate humans nearby more than other birds, especially when they are drawn by flowers in the garden and hummingbird feeders. Every year when the hummingbirds return to our yard, I am reminded that I enjoy watching them more than almost any other bird, and how very different they are from most of the other birds I’ve seen. I’ve also been lucky to see hummingbirds not just in Western Canada, but also in the West Indies visiting my grandparents. Alberta has so many brightly colourful birds — such as the American Goldfinch, Mountain Bluebird, Purple Finch — that it could be hard for a hummingbird to stand out. But whereas some birds are brightly coloured, the hummingbird’s coloration is a bit more subtle with a metallic sheen which can become quite eye-catching as the sun hits the feathers. In addition to the iridescence, many male hummingbirds have beautifully coloured head and gorget feathers: in the the case of the Ruby-throated Hummingbird (Archilochus colubris), a bright metallic red throat patch; the Broad-Billed Hummingbird with its red bill, and dazzling blue throated males; and Costa’s and Lucifer Hummingbirds with iridescent violet or purple crowns and gorgets. I hope one day to find a hummingbird feather to study under our microscope. I have read that a group of hummingbirds is called “a glittering of hummingbirds” and given the metallic sheen of their plumage, it seems a very good description. Each spring I anxiously wait for the Ruby-throated Hummingbirds to arrive at our farm at the end of their long migration. Having traveled far, often through harsh conditions, the small birds’ ability to navigate such a long trip is remarkable. Just from the Yucatan Peninsula to Edmonton is a distance of more than 6,000 kilometres. And each year, as I learn more about birds, I find the journey and the perils the birds survive more, and not, less amazing. Living in eastern Alberta, I am lucky to be within the western limit of the Ruby-throated Hummingbirds’ summer breeding range. And I very much appreciate that this bird family is found only in the Americas. We are so lucky to be able to enjoy their presence in the summer. We usually have two pairs of Ruby-throated Hummingbirds who return annually. They like to sit, and possibly nest, in a spruce tree just north of our house, a few feet away from our dining room window. I hope that this year I’ll be able to find a nest and watch the nestlings grow and fledge. They also spend time at the feeder on the deck, near chairs, where they sometimes fight with each other, and also in the flower garden, where they like the nectar from the Maltese cross, columbines, lilies, nasturtiums, and catmint, and don’t seem to be bothered by the fact that we are gardening nearby (well, my mother keeps gardening while I stop quietly to watch). It is amazing to see the birds stop short exactly in front of a feeder or flower, hover as long as they need, or fly backwards. I especially enjoy the males’ dramatic and dizzying aerial displays. In 2010 when my family was on the West Indian island of Nevis, visiting my grandmother, I was able to see many new species of birds, including three new species of hummingbirds — Antillean crested Hummingbird (Orthorhynhus cristatus), Green throated Carib (Eulampis holosericeus), and Purple throated Carib (Eulampis jugulars). I had several unexpected and exciting encounters with Antillean crested Hummingbirds, the smallest bird species on the island. One day, I had to rescue a hummingbird stuck in the garage ridge vent, almost 20 feet off the ground. With the help of a ladder, I was able to get the hummingbird and me safely to the ground. Sitting on the grass, I let it rest for a while on my open hand — which gave me the chance to study its beautiful feathers and delicate features — and after a few minutes it flew to a nearby red ixora shrub to rest some more. Another time, I was waiting in our car for my parents to return from shopping, and passed the time watching a bullfinch singing on a branch. 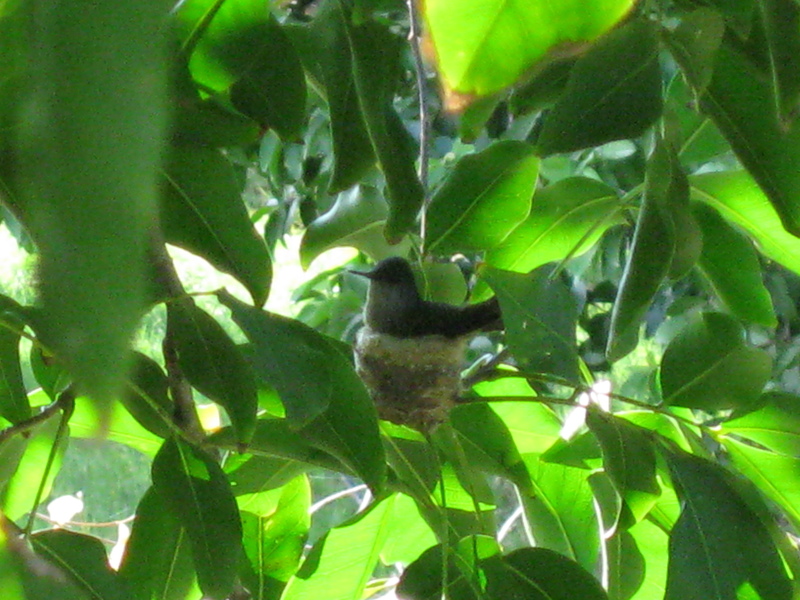 Suddenly, and just as my parents returned, a female Antillean crested Hummingbird flew by and sat on her nest. 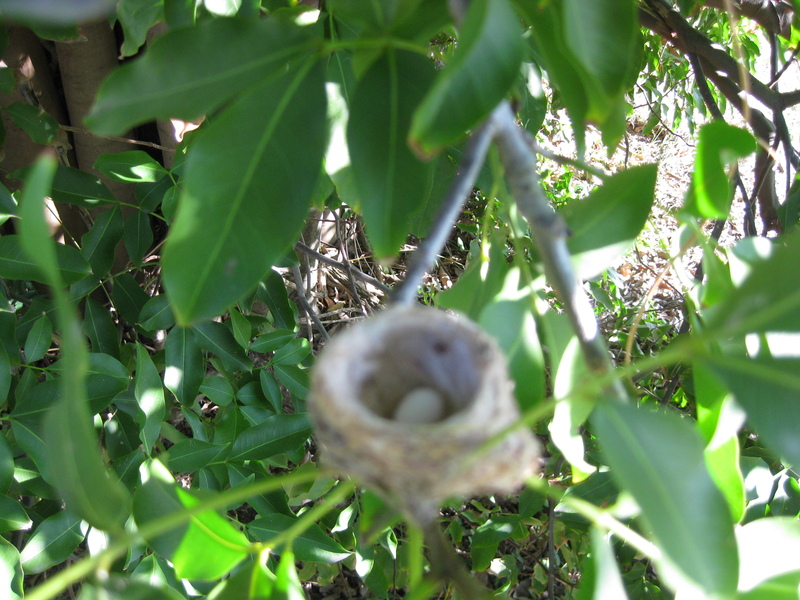 I had never seen an actual hummingbird nest before, so we asked the home owner if we could go in his garden for a better look and some pictures. There weren’t any eggs yet in the nest, and we never had a chance to go back, but it was still thrilling. These are just some of the reasons the hummingbird is my favourite bird species is the hummingbirds. In the future, I would like to read and study more about hummingbird hybridization, between closely related species and species in different genera, and see for myself the different combinations — just one more reason they are such a fascinating species. This entry was posted in Alberta Birds, General Birding, Nevis Birds and tagged Antillean Crested Hummingbird, Hummingbirds, Purple-throated Carib, Ruby-throated Hummingbird. Bookmark the permalink. Wow! quite an essay, and great photos, too. Thank you, Bob, I’m glad you enjoyed it! Thank you very much, Reid, I had a lot of fun writing it. Really well done. The Antillean Crested in your hand is a marvel–what a thrill that must have been.